Your kiddo almost looks like he’s ready for a magical adventure off in Neverland. The only thing he’s missing is this Child Peter Pan Costume! Grab him this playful outfit and he’ll be ready to head off with the Lost Boys on endless escapades. Once your little one goes green with this outfit, he’ll not only be a part of the Lost Boys, but he will be their leader! We hope he’s ready for what’s in store for him. That dastardly Captain Hook is always trying to capture Peter and his friends. So we think that it may be a good idea for you to train your kiddo in the art of sword fighting. Maybe if you teach him how to fence, he’ll teach you how to fly! We’d say that’s a fair trade. 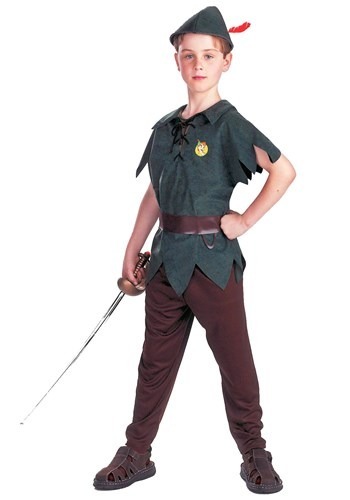 Grab him a trusty sword to run around with this Halloween and his Neverland transformation will be complete. Now, we just want to give you heads up to keep an eye on your little one’s shadow. Peter Pan’s shadow always seemed to be a bit mischievous.So if you start to notice any shenanigans after you get this costume for your youngster, don’t be so quick to point fingers. Check to make sure that his shadow is still attached! Growing up is never fun. Help your kiddo hold onto his childhood with this awesome Peter Pan Costume. Let him run off to Neverland this Halloween and enjoy flying around the neighborhood with Tink and the rest of the Lost Boys! 4 year old grandson changes costumes every hour! My 4 year old grandson loves clothes - matching outfits and Disney character costumes...he literally changes clothes about every hour on the hour. He'll be Jake the Pirate then Batman, then Superman,...then Alabama football player...then go into dress mode with kaki pants and dress shirt with matching shoes. Cracks me up! Will love the Peter Pan costume - it is part of his Christmas.